The Untold Stories is an expansion module for Heroes of Normandy. It contains eight new scenarios - plus a bonus scenario in which two scenarios are combined to form a larger one. Two new maps depict the lush Norman countryside, presenting winding streams, a tree-lined farm and a quaint village. Vital bridges need to be destroyed, important villages need to be controlled, daring rescues need to be made and vengeance must be doled out - no matter the cost. Heroics, leadership, and, as always, luck can mean the difference between victory and defeat. Now you can read the stories and then play them out on your gaming table! To play The Untold Stories you must own heroes of Normandy. 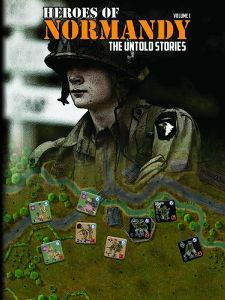 Heroes of Normandy: The Untold Stories delivers seven action packed combat stories. You'll parachute behind enemy lines with a young Airborne soldier in the early morning hours of D-Day in "The Stovepipe Bluff" and lead British troops forward to battle with "Mack the Knife" and Lieutenant Julian as they discover the truest definition of heroism. In "Mission of Vengeance" you'll witness the same events through the eyes of retreating Germans and advancing Americans and might end up rooting for both sides to survive. In "The Reluctant Shepherd" you'll see how a seasoned British non-com whips his soldiers into fighting trim, and in "The Church" you'll experience a gritty assault against a stronghold in a German-held town, and learn the terrible secret hidden there. "In the Presence of My Enemies" sends a German squad behind enemy lines to retrieve a wounded SS officer, and the luckiest soldier in the US Army joins forces with the British jinx to wreak havoc in "The Dice Have no Memory."